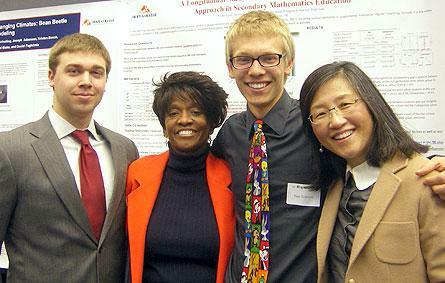 The collaborative faculty-student research project “Project-Based Learning (PBL): The Cognitive and Motivational Impact on Secondary Students of Mathematics” has won the college’s fourth annual “Social Sciences Young Investigators Award.” From left to right to right are: senior Nicholas Haugen of Kalamazoo; Dr. Vicki-Lynn Holmes, assistant professor of mathematics and education; junior Sam Pederson of Mount Prospect, Ill.; and Dr. Yooyeun Hwang, professor of education. The team received the recognition for “Project-Based Learning (PBL): The Cognitive and Motivational Impact on Secondary Students of Mathematics.” Holmes, who has taught at Hope since 2009, received the award as a junior member of the faculty who has mentored students in research. In addition to Holmes, Dr. Yooyeun Hwang, a professor of education who has taught at Hope since 1996, was the co-leader on the project. The students participating in the project were senior Nicholas Haugen of Kalamazoo; and junior Sam Pederson of Mount Prospect, Ill. The competition is open to junior social science faculty who worked with students on a significant research project, with at least one of the students returning for the next academic year. The selection is made from among the eligible social science projects highlighted during the college’s annual Celebration of Undergraduate Research and Creative Performance, which was held on Friday, April 12, this year. The team’s longitudinal research project examined the effectiveness of Project-Based Learning. For three years, the researchers followed two comparable groups of eighth- and ninth-graders, one from a school using PBL and the other using a traditional mathematics curriculum. The study found that through the PBL approach, the academic performance gap was significantly diminished and all students became stronger in employing effective study strategies, critical thinking skills and self-regulation, while showing high self-efficacy and significantly lower test anxiety.